Anita is Director of Secondary Teacher Education at Bates and previously taught high school English for over ten years. In the past, she has taught a wide variety of ages and abilities, from first graders in Jersey City, NJ, through adult learners, teaching subjects as diverse as French and Alternative Education programming. She has mentored many new and student teachers, and has presented statewide workshops on a wide range of topics, including autism in the classroom, special education topics and laws, and classroom management. In addition to her work at Bates, she teaches distance education courses through St. Joseph’s College in Standish, Maine. 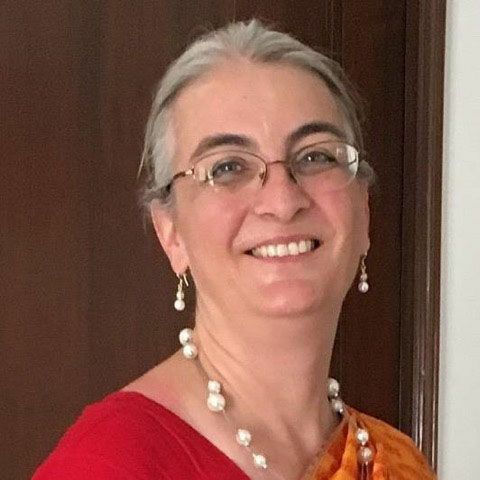 As a Fulbright Scholar in India from January to May 2016, Anita taught undergratuates and explored issues of literacy and inclusion in preK-12 schools and programs. Subsequently, she is engaged in an ongoing research project studying inclusive education for children with disabilities in India. Anita has a Ph.D. from University of New Hampshire in the area of Adolescent Literacy. Her dissertation entitled “‘It’s Just Part of What We Do’: Adolescent Interactions with Multimodal Texts Across Social Spaces,” won two national awards. She holds an M.Ed. from Harvard in Human Development and Psychology, with a special focus on Language and Culture; and a B.A. from Darmouth College in French and Education. Her interests in the field of education include Teacher Education, Literacy, and Special Education. Anita recently had a chapter entitled “‘There’s a relationship’: Negotiating cell phone use in the high school classroom” published in Researching New Literacies: Design, Theory, and Data in Sociocultural Investigation (Knobel & Lankshear, eds). She previously published a chapter in an anthology entitled The first Year of Teaching: Real World Stories from America’s Teachers. Anita lives in Auburn with her husband and five children.